Signifcant calls we receive about wasps turn out to be calls for bees. As bees are highly beneficial to the environment, we do not provide treatment for these insects. It is often difficult to distinguish between bees and wasps so please read the information on this page before you contact us. Many people report sightings of wasps (particularly in April/May) - which are actually bees (honey bees, solitary bees or mortar bees). If the "wasps" are going into holes in the brickwork you should look carefully to see if they are going in or out of a single hole/ or investigating several holes. Wasps will use a single hole but bees will investigate several. A further test is whether the activity continues on cold overcast days or just warm sunny days. Mortar bees will only be active on sunny days. If you see a large mass of what appears to be wasps hanging in a tree, hedge or post about the size of a football and they are small and uniformly brown, this will be a swarm of bees. Only honeybees swarm. Bumble bees, solitary bees and wasps do not. The swarm will move on often within hours or otherwise within a few days. At the end of the summer the nest will be abandoned and will not be reused. Any remaining wasps will die naturally. 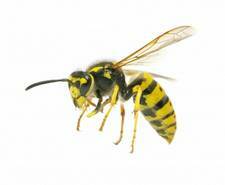 Wasps are bright black and yellow with little or no hair. They are typically 1-2 cm in length and do not swarm. There are different types of bee but (apart from Bumble bees which are furry with long hair) they are all usually smaller than wasps and are furry with short hair. Honeybees will swarm in spring and summer. Wasp nests are not always visible, therefore the Pest Control Officer will do everything they can to remove the nest after treatment. With this in mind, it is only usually possible in areas like sheds, garages etc where access can be gained safely that we would remove the nest. Quite often though, they are located at height (around the facia boards/guttering area). We don’t tamper with any building structure to locate the nest as this is the responsibility of the home owner. Treatment can consist of an Aerosol and or Insecticidal Powder either directly into the nest or where this is not possible (see above) around the entry points of where the Wasps are going into. Where treatment is needed at height, poles are used to pump the powder into the point of entry this eliminates any use of ladders. On rare occasions, Pest Control Officers may not be able to treat due to for example Environmental issues/safety or access. Where this is the case advice will be given on the best course of action and where relevant a Private Contractor could be called by the customer. Please Note – Even if we cannot remove the nest this will not be reused in further years by other wasps.